Are you affected by gun violence? I had never thought much about the impact of gun violence on my own life until I read Alex Kotlowitz’s piece in the New York Times Sunday Review. The story is about Chicago right now the worst urban area for gun violence, but what he describes could apply to anyone, any place. We talk a lot about the post traumatic stress of those who were in the movie theater in Aurora or the citizens of Newtown, but we don’t talk about the victims of the violence that happens every day one or two or three people at a time. And we certainly don’t talk about what happens to the rest of us. I live in a neighborhood that is considered to be highly desirable. Rents have increased as houses have been renovated. Three families have been condoed. There are stories in the paper about the sales price of homes. But 20 years ago, there was a gang gun fight in front of our house. The bullet hole is still in one of the vestibule windows. A couple of years ago, a boy playing on one of the basketball courts, 4 or 5 blocks down the hill from us was shot and killed. I have friends who have lost children to violence. One can’t escape. All of this is somewhere in the back of my mind when I walk or drive in our relatively safe, desirable neighborhood. If I stop for a moment to think about violence, I think about my own neighborhood. And if I am affected in a relatively minor way, what about the children? This is the question that Kotlowitz asks. EVERY year, the Chicago Police Department issues a report with the macabre title “Chicago Murder Analysis.” It’s a short but eye-opening document. Do the calculations and you realize that in the past 15 years, 8,083 people have been killed, most of them in a concentrated part of the city. There’s one particularly startling revelation that gets little notice: in 2011, more than four-fifths of all murders happened in a public place, a park, an alleyway, on the street, in a restaurant or at a gas station. When Hadiya Pendleton, the 15-year-old public school student and band majorette who just a week earlier had performed at President Obama’s inauguration, was killed on Jan. 29, she was standing under an awning in a park with a dozen friends. They all saw or heard it when she was shot in the back. One of them, in fact, was wounded by the gunfire. Which brings me to what’s not in the “Chicago Murder Analysis”: Over the past 15 years, according to the University of Chicago Crime Lab, an estimated 36,000 people were shot and wounded. It’s a staggering number. We report on the killers and the killed, but we ignore those who have been wounded or who have witnessed the shootings. What is the effect on individuals — especially kids — who have been privy to the violence in our cities’ streets? The ugliness and inexplicability of the violence in our cities comes to define you and everyone around you. With just one act of violence, the ground shifts beneath you, your knees buckle and all you can do is try the best you can to maintain your balance. But it’s hard. In December, the Department of Justice released a little-noticed report that suggested that children exposed to community violence might turn to violence themselves as “a source of power, prestige, security, or even belongingness.” The report went on to recommend that these children should be treated by professionals. At Hadiya Pendleton’s school, the principal said that over the Christmas holidays two students were shot and injured. If their experiences were at all typical, they were undoubtedly treated at a hospital emergency room and then released without any referral for counseling. When the NRA talks about increasing mental health services instead of measures which might begin to stem the flood of guns, legal and illegally owned, washing over us, I don’t think they mean poor inner city kids. I don’t think they mean funding for more programs like Dr. Corbin’s. If they do, now is the time to speak out. 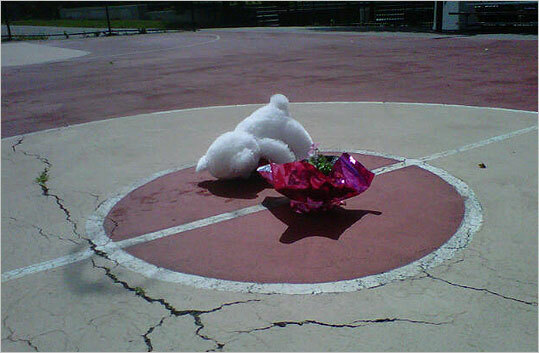 The basketball court where Jaewon Martin died. A popular honor roll student, Martin would have graduated from the eighth grade at the James P. Timilty Middle School in Roxbury at the end of the school year. Martin was well-liked and well-known by students and staff alike, and his family was very involved in the school, said Boston Public Schools spokesman Matthew Wilder. “It’s a really tough day for the school community,” Wilder said. Grief counselors will be on hand at the school to help students and faculty members cope with Martin’s death. Was there any additional follow up after the initial counseling? What has happened to the other students in Martin’s class at Timilty or to others who knew him? Is there PTSD? Do we care? I think this is the point of Kotlowitz’s story. We need to care. As Tim O’Brien says, it gets in your bones. In the wake of Hadiya Pendleton’s shooting, we’ve talked about stiffer gun control laws, about better policing, about providing mentoring and after-school programs, all of which are essential. But missing from this conversation is any acknowledgment that the violence eats away at one’s soul — whether you’re a direct victim, a witness or, like Anita Stewart, simply a friend of the deceased. Most suffer silently. By themselves. Somewhere along the way, we need to focus on those left behind in our cities whose very character and sense of future have been altered by what they’ve experienced on the streets. The answer to my title question is yes you are. If you don’t live somewhere violence happens with regularity, you are still affected because your future will be in some measure determined by these victims of violence. This entry was posted in Culture, Public Policy and tagged Alex Kotlowitz, Gun violence, Hadiya Pendleton, Jaewon Martin, Politics, post traumatic stress, Public space. Bookmark the permalink.